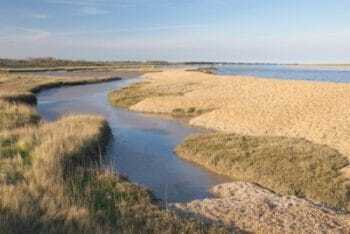 A beautiful and historic stretch of the Suffolk Coast offering wild solitude, the crash of waves, the sight of wheeling sea birds, and the sound of the wind. With marshland behind you and the beach in front, cottages confront the North Sea across great tracts of stones. It is one of the iconic views of Suffolk. Offshore, a welter of white water shows where the outgoing River Ore collides with the incoming breakers.